LA VILLA — Officials here broke ground in late February on a $4 million wastewater treatment plant expansion to keep up with the demands of the 1,300-bed private prison. The U.S. Department of Agriculture awarded the city of La Villa a $1.6 million grant along with a $2.4 low-interest loan in 2017 that will be paid back over 40 years. 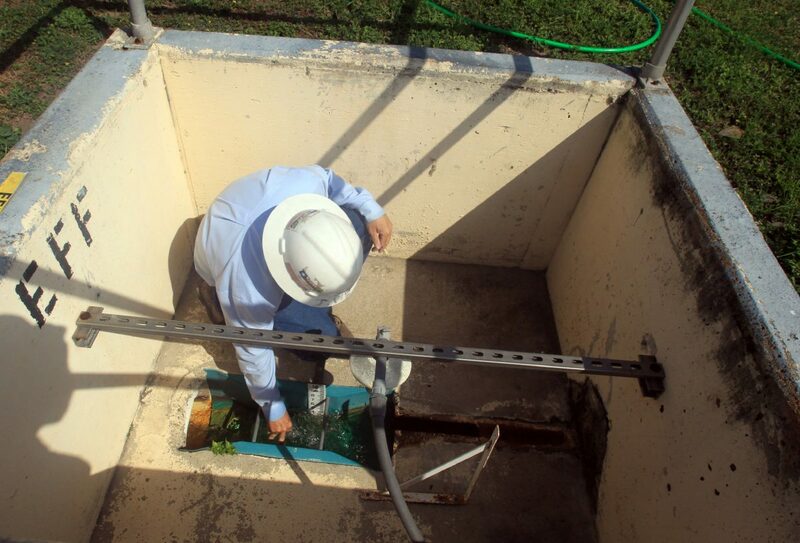 Initially, the city considered a $4 million loan to expand the decades-old wastewater treatment plant because it had been frequently operating overcapacity, said City Administrator Arnie Amaro. The about $2.4 million loan is secured by certificates of obligation and backed by ad valorem taxes along with wastewater works revenues. Yet, there are no plans to increase water and sewage or property tax rates to foot the cost of the multi-million-dollar project. Johnny Wells, La Villa wastewater plant operator, tests a sample of treated water at the La Villa wastewater treatment plant Tuesday, February 27, 2018, in La Villa. Johnny Wells, La villa wastewater plant operator, collects treated water for sampling and testing as the La Villa wastewater treatment plant Tuesday, February 27, 2018, in La Villa. After treatment, the water in released into canals where it eventually drains to the Laguna Madre. The city’s engineer — La Feria-based Fulcrum Consulting Services along with Ferguson Construction — began working on the expansion in February. Plant supervisor Johnny Wells last November notified the Texas Commission on Environmental Quality about the facility, which has a flow capacity of 200 million gallons per day, working overcapacity by 21 percent. 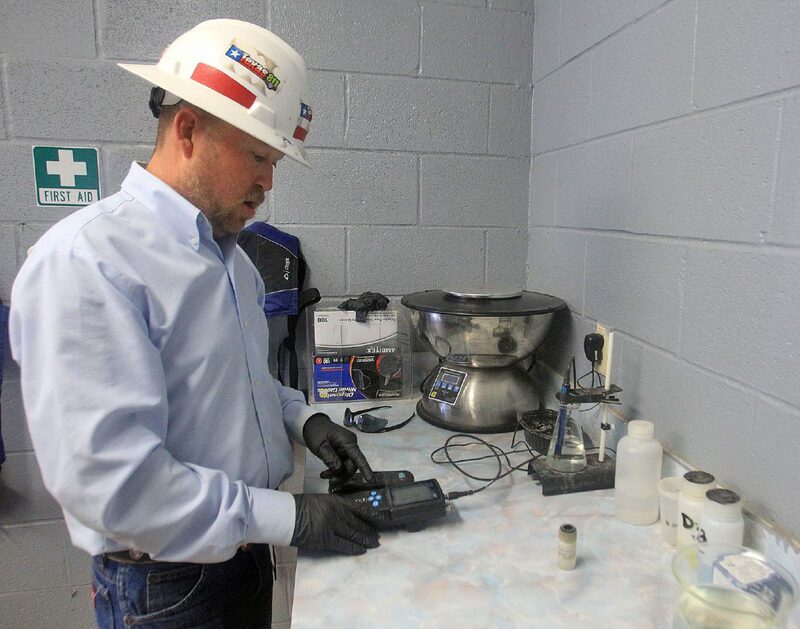 A TCEQ inspector found 11 potential violations at the plant last August, including failure to maintain systems of treatment and effluent limits. “It’s no secret. The state was breathing down our neck,” Amaro said. The wastewater treatment plant has constantly been operating beyond its effluent discharge permit parameters of 200 million gallons per day. “I’m over that every day,” Wells said. The expansion will sustain 580 millions of gallons per day — an additional 380 million more than the current flow capacity. “The day that the first flow comes into the (upgraded) plant, we’ll be finally in compliance for the first time in over 10 years,” Wells said. 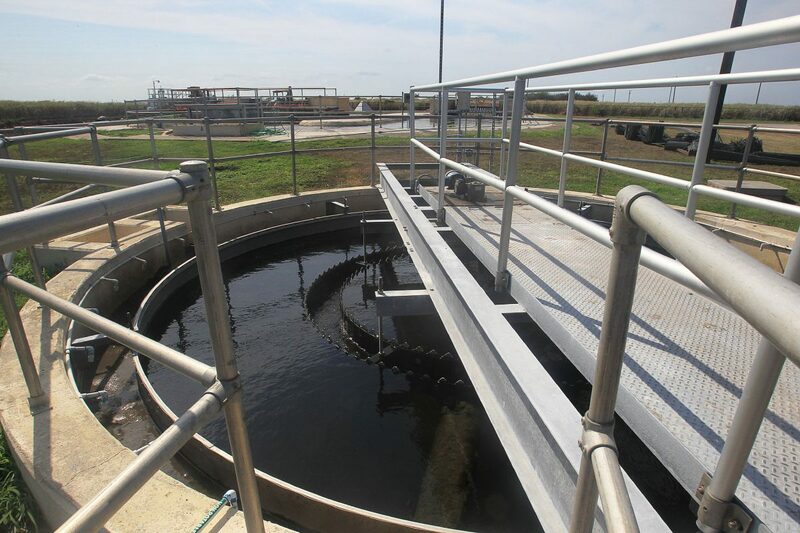 Water from toilets, bathtubs and city drains flows into the plant to be treated with a series of chemicals to remove pollutants before being released into nearby drainage ditches that eventually feed into the Laguna Madre. The current plant, though, cannot keep up with all the wastewater from the city’s about 2,000 residents and an additional 1,100 to 1,200 people imprisoned in La Villa. The prison uses a large chunk of the city’s utilities — about 40 to 45 of the total, Amaro said. The financial benefits for the private prison and the city are a two-way street — GEO Group, as part of an agreement, pays the municipality $1.50 a day per incarcerated person. Part of the per diem will be used to pay back the loan, Amaro said. “With this expansion here, we can sleep a lot better at night knowing that if there’s ever a need to expand (the prison population), we have the capacity to sustain it,” he said. The plant’s expansion should be completed by March 2019. Of the $4 million, $3.1 million will go toward actual construction, $330,000 for engineering fees, $104,000 for inspection, $335,000 for contingency and the rest will be used for land and rights-of-way, legal fees, bond counsel and interest. “I very firmly feel that the city needed (the expansion) very badly, to survive and ultimately continue to grow,” Amaro said.